An indication of a beautiful property is how the home itself complements the outdoor living space. One of the best ways to enhance this setting is with sliding patio doors. Below we’ll discuss some of the key benefits that sliding glass doors bring to a home. Sliding doors offer much more than a beautiful view of the outdoors from the home. They also provide the framework to produce a wealth of additional space inside and outside. Listen, we love all doors but in the area of a patio, sliding doors reign supreme. Why? Let’s say for example you have a 3 foot hinged patio door. The swing radius of the door will take up at least 3 feet of space for the 180° area the door, and that’s with minimal clearance. More feasible estimates would leave spacing of around 4 ½ to 5 feet. Think about how much closer a living room table, breakfast nook or any household item has to be to one another when you get a swinging door vs a sliding door. If a hinged door was to open outwards into the patio space, consider the saved space your outdoor living space would gain. 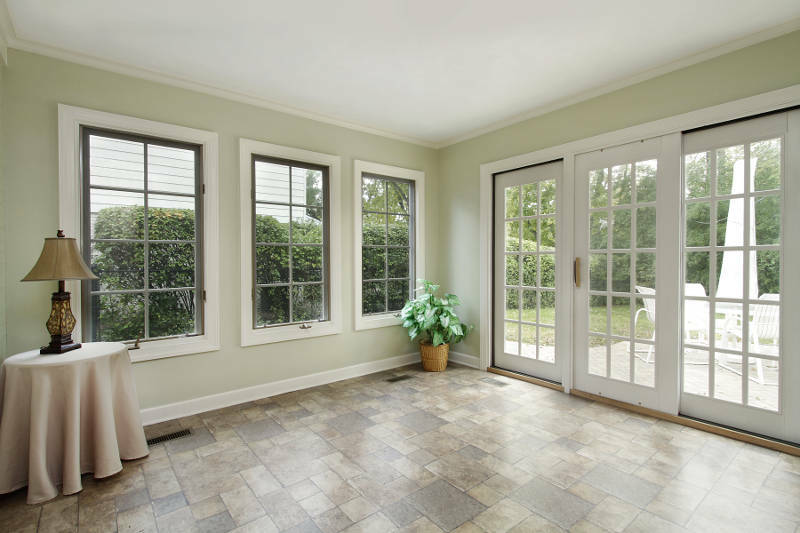 Sliding patio doors save you space, which is why they’re often used in home remodeling. We see it all the time on home improvement programs – a wall is taken out and an open concept is implemented. Sliding patio doors add an attractive look to your home that’s simply unmatched. The openness that the door brings makes for an elegant style from both an interior and exterior view. There are various different type of glasses that can be used on these doors – tinted, textured, stained, etc. The options can truly make a home stand out. The doors also allow for a homeowner to be creative in the decision of blind choices. Whether it’s to match to concepts of the furniture indoors or a statement piece that stands out. Even if you have a glass hinged patio door, the amount of natural light produced will only be roughly half of that produced by a sliding door. This natural light is a great way to get prepared for the day ahead. Let the natural sunlight shine in while you sip your morning cup of coffee. Not only will the benefits of the natural light help bring to your body and mind, it’ll also help your pockets, as well as the environment. It’s truly astonishing how much natural light can radiate into the home. You may not need to turn any lights on in the room until dusk sets in. This may not seem like much, but over the long run, the savings will add up. You may begin to think about lighting and energy differently and make more energy efficient decisions throughout the rest of your home. Sliding patio doors make great use as a temperature control mechanism. On hot days, you can simply crack the door a little and let in some natural air. It’s true that the same can be done with a hinged door, but most likely it’s going to be swinging and the opportunity for items or debris to enter the home will be much higher. Using a screen, you can open the glass door completely if wanted, protecting your home from the debris as well as insects from the outdoors. Patios are often a place for gathering, cookouts and barbeques. At these events, there’s often high traffic in and out of the door, with many not being truly familiar with your home. Hinged doors can be on issue because on one side of the door (if not glass) can’t be seen. A door opened or closed too aggressively can cause harm to those on the other side. This may seem like an unlikely occurrence but it can happen, especially with small children. Another issue is falling. In some cases when someone’s natural momentum goes with the swing of the door it can cause falls. With sliding glass doors, this problem is also eliminated. Other safety concerns include the case of improperly closed or locked doors. Sliding doors are less likely to not be fully closed, and in the cases that there’s a heavy wind, it won’t swing the door uncontrollably causing damage to the home or luring criminals. Sliding glass doors are often manufactured using very thick glass which is strong enough to endure anything thrown at it from rain, snow, hail and heavy wind. The locking devices of these doors are often more simple than other systems’ aftermarket locks. Consider a double bolted lock to protect your home. Implementing a security bar at the bottom of the door is also a great way to add additional security. Have you ever tried to get a new furniture piece in through a doorway to no avail? Sometimes it may work, other times, a door needs to come off the hinges for the item to fit. Even in times where the item does actually fit, it does so at the expensive of paint on the wall and causes dents. Leather or cloth items can be ripped or damaged in this process as well. Sliding patio door openings are often fairly bigger than their traditional hinged counterparts, making the process of moving items in and out of the home much easier. 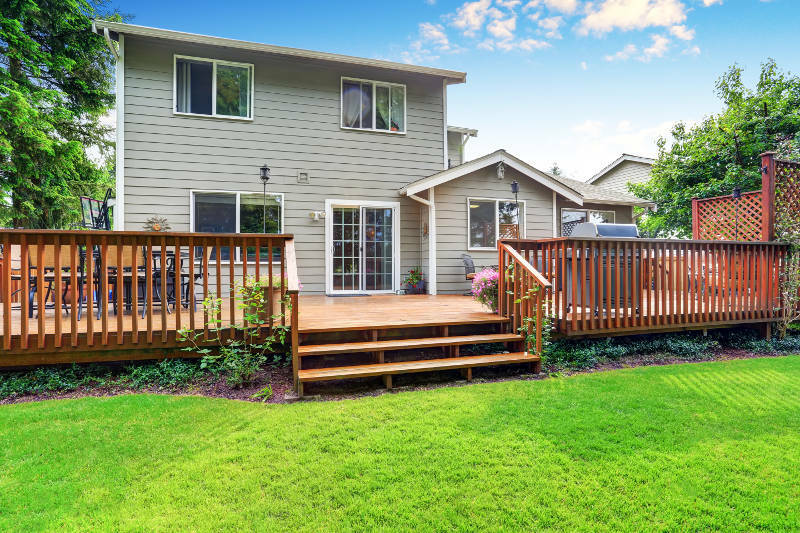 Even in the cases where the sliding patio door opening is the same size as a hinged door would be, the door width itself can never truly be eliminated from the opening width, taking up about 2 feet for most exterior doors. All things considered, sliding patio doors offer many benefits to a home as well as the members of the home. They can help secure them, improve the space of the home as well as save you money on the energy bill. Sliding patio doors are an investment that pays off in the short and long run, constantly improving the value of a home. Feldco offers high quality, vinyl sliding patio doors to Quad Cities homeowners. Not only will you get a fantastic product but it will be installed by factory trained and certified professional. Get a free quote now.